Boston Rd. to Station Rd. « Bolanz Rd. to Boston Rd. After a rocky start in Boston Mills, the river meanders into a maze of braided channels and tree jams on its way to the historic Station Road Bridge. 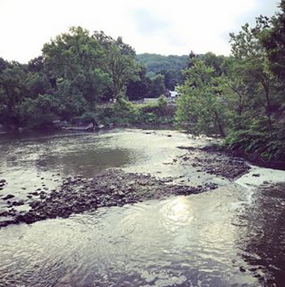 Tributaries include Spring Creek, Columbia Run, Brandywine Creek, and Chippewa Creek. The put-in and take-out use relatively new CVNP river access points. By late August, the canal diversion dam at Station Road should have been removed—a victory for FoCR, and for the health of the river. We’ll have a look. For paddlers who can control a boat in moving water.